From Max Factory. 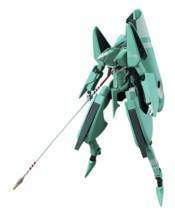 From the anime series Knights of Sidonia comes a figma of the Garde piloted by Izana Shinatose, the Series 18 Garde. An alternate 'Heigus Particle Cannon' head part is included to display the Series 18 Garde firing the particle cannon. The standard weapons of the Series 18 Garde are all included - the Kabizashi spear, arm blades and a ballistic acceleration device. A pointed back booster part for high-speed movement poses, as well as a Gauna core that can be attached to the Kabizashi, are included. ORESHURA: COMPLETE COLLECTION [Z4] ORIGIN: MOVIE - S.A.V.E. NARUTO UZUMAKI NARUTO FUJIN GEM SERIES REMIX FIGURE NENDOROID MORE DRESS UP WEDDING - ELEGANT VER. GUNDAM 08TH MS TEAM RX-79G GROUND GUNDAM HGUC MDL KIT GUNDAM 1/144 HG SUPER FUMINA AXIS ANGEL VER. SAILOR MOON PETIT CHARA CHRISTMAS VERSION SAILOR MOON PETIT CHARA KYOTO MARUBENI VER.